They were sick of the food God had provided for them. They grumbled that God had brought them out of Egypt to kill them in the wilderness. Everything was wrong. With them, with Moses, with where they were and what they were doing. And they let it be known that they were unhappy. God sent them a message. The snakes bit the people and people died. Lots of people died. Israel got the message and they asked Moses to intercede with God for them. They admitted and confessed their sin and asked God to remove the vipers. But God didn’t take them away. God heard the people and He answered their prayers. Just not how they wanted. After all, they confessed their sin and repented. An immediate resolution would have been nice. But God didn’t do that. There were consequences to their sin. Lingering, painful and potentially deadly consequences. The vipers were not removed from their camp. In fact, the vipers still bit the people. If it were me I’d be begging… But God, I told You I was sorry! I repented. I quit complaining and got my attitude taken care of. Why are these vipers still here? Why are we…why am I still being bitten by snakes? There are consequences to our actions. God doesn’t just sweep them all away when we come running back to Him. Sure, He may sometimes, but more often than not, He doesn’t and we have to live with those consequences. The Israelites wanted a quick fix—the removal of the problems brought on by their sin. Instead God gave them an antidote for their problems. FAITH. When the people were bitten they were to look at the bronze serpent on the pole and have FAITH that God would take care of them and heal them. They had to take their focus off their problem and off their pain and look to God in faith. That antidote is still valid today. But we need to let go of our stubbornness and pride and turn our attention to Jesus. We need to take our focus off our problems and pain and focus on the antidote: Jesus. God didn’t leave Israel to die in the wilderness. He provided for them and brought them into the Promised Land. As His children, God won’t leave us. He’s given us that promise. When it comes to dealing with consequences, we need to take our eyes off our problems and look to Jesus. Focus on Him and Him alone. He goes with us and He will not fail us nor forsake us. In the past few days I read Numbers 13 and 14. It’s a story that we learn in Sunday School as children and a passage that I both love and dread. The nation of Israel has left Egypt and slavery behind. They’ve crossed the Red Sea on dry ground, taken the long way through the wilderness, have seen God work in miraculous ways for months, and now they’re camped at Kadesh-Barnea. They’re a stone’s throw from the Promised Land—the place generations have dreamed of returning to. For 40 days the Israelites wait to hear about the land God has brought them to—the land He said He was giving to them. I always want to shout, No! Don’t do it! Don’t you remember the slavery? How could you even think of going back? Don’t you remember all the things God has been doing for you? Truth be told, I’m so much like the nation of Israel at this point that it’s…terrifying. Kadesh-Barnea. It’s a place I’ve been to many times in my life. It’s a place that I really have mixed feelings about. A place of excitement as I look toward the anticipated opportunity. A place of anxiety as I looked toward the unknown. It’s also become a place of disappointment as fear takes over and I turn around and head back into the wilderness. It's funny how God orchestrates all the details of life. 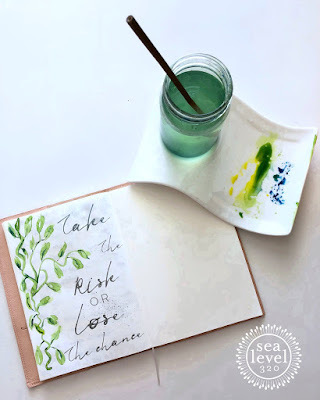 Take the risk of lose the chance. Photo by Cheryl Flatt. I was chatting with my sister the other day and she sent this quote to me. She was talking about herself but it stopped me in my tracks. It was the THIRD time the same message was hitting me in a very short time. For three months I’ve been keeping some things buried but it all came gurgling out as I furiously texted Cheryl. I knew I was at the river. Again. And I feared that if I didn’t step this time that the wilderness would claim me for good. I knew all the obstacles and objections. I’ve lived with them many times in my life. It was time I refocused on all that God has done and is doing. That’s when I realized that there was no risk in obeying. I really had nothing to lose. What about you? Are you sitting in your own Kadesh-Barnea listening to reports of great obstacles and how small you are in comparison? Don’t listen to them! When you obey God, He fights for you and what the enemy means for evil God turns into good for you. I’m not gonna lie, it will be hard. There will be losses—but maybe some of those losses are things you need to lose (me too!!). Turn away from the voices that say you can’t or shouldn’t and tune your ear to God. Remember and focus on all He’s done for you and move forward. Sometimes you have to take the risk or lose the chance. For 7-8 months I have not been obeying. I’ve about reached the point of being miserable because of it. I’m reading and studying God’s Word and praying but I’m still feeling like I’m stranded in a cave half way up the cliff. Nothing in front of me but fog and behind me is a dark cave with who-knows what lurking inside. I know God has heard me. I know He’s still there. But I feel like I’m lost in the fog. I don’t want to go into the cave. I mean, I really, REALLY do NOT want to go into the cave, but the ledge I’m standing on seems to be getting smaller every day. The simple answer is easy: Obey. But things…life is never as simple or easy as that. Especially that particular word. But how can I obey when I know what it will involve? I know the time it will require. The focus. The energy. What if it means I have to choose between obedience and some (or worse, all ) of the things I’ve come to treasure? I know why I feel like I’m lost in the fog. Why it feels like God is far from me, and the space between us is ever increasing. Why it feels like God is no longer talking to me. My head knows He’s still there but my heart is missing His nearness, His voice. It’s because I haven’t obeyed. I haven’t done the thing I KNOW He wants for me to do this year. God’s quit talking to me because I have yet to do the thing He’s already to me to do. I can’t take another step anywhere until I go back and do that one thing. you cannot move ahead to the next thing. So here I am, taking a step of obedience. Dear Lord, forgive me for being so obstinate, for even now digging my heels in, fearful of what obedience will require. I want to obey You. Really I do. I want to feel close to You again. I want the joy and peace…YOUR joy and peace that comes with obedience. Help me to obey You because I cannot obey in my own strength. I’ve been trying and it doesn’t work. Please, Lord, give me YOUR power to obey, to do the thing You’ve given me to do. When the light is poor, get closer. Closer allows you to see so much more. More color. More detail. The dreariness fades into the background as you’re consumed by color and detail. Things you couldn’t see from a distance are not only visible up close but beautiful. That’s so true in our Christian lives too. When the light is dim, when it’s hard to see our path, get closer. Closer to Jesus, the Light of the world. Sit with the Word of God and read. Sometimes the only thing we can do when our world goes dark is get closer to Him and immerse ourselves in His Word. We can’t see which way to go. We can’t see where our path is or what’s on it. But we can read His promises. We can meditate the promises of God that we’ve hidden in our hearts. Words of life and light. We still may not be able to see our path or know which way to go, but we will be closer to God, the One who goes before us and promises to never leave us. On dark and dreary days get closer to God. Up close we see so much more. More color. More detail. More beauty. For the past couple years I’ve had a word for the year. It has been such a help to me! Each word has helped me grow in ways I didn’t anticipate. In November, when I realized how fast New Year’s was coming, I started asking God for my word. My experience has been that settling on one word for the year was…not as easy as you’d think. LoL. So, I started early. Surprisingly, within days I knew my word for 2016. I was amazed. And terrified. I have to admit, I hoped the word would change into something easier, nicer, even inspiring, but no. The word didn’t budge. Didn’t even wiggle. I’m consistently INconsistent, so the thought of this word does awful things to me. Truly. 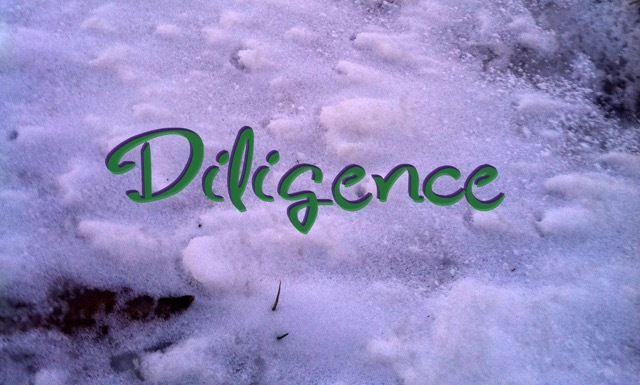 As I look at 2016 and the things I want to do mixed in with the things I need to do, all overlaid with family and balance, I know the only way anything on my want-to-do list is going to be accomplished is through diligence. Daily diligence in the little things. 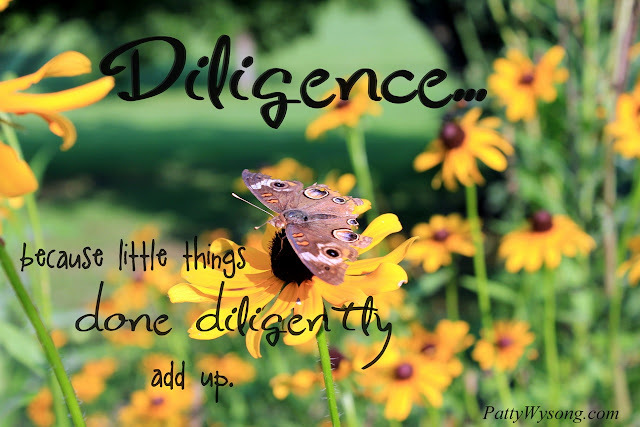 Because the little things done diligently add up to bigger things. My head knows this and I’ve experienced it, but putting this into practice when I have five other things pulling me different directions…well, let’s just say I’m very good at putting out fires and getting stuff done that needs to be done, and putting off things that I can put off. Like the things I want to do. The problem is that the things on my want-to-do list are things I believe God has called me to do. But those things aren’t standing beside me, pulling on my pant leg saying “Mom. Mom! MOM! !” (or some variation of that. You know what I’m saying.) Those things are part of that quiet voice in my heart. The voice that’s so easy to miss or set aside when the roar of life gets loud. And there lies a good part of the issue. The need to prioritize (shudder) and see that those things on my want-to-do list are so much more than that. They are actually my heart’s list of things I see that God has given me to do. Things that God has given me as a gift, just as He gifted the Levites with the service of the Tabernacle and Temple. When I see those things for what they really are—gifts from God and things He has called me to do—I can prioritize my time and energy and resources to get them done. One small thing at a time. Because little things done diligently add up. For the past couple years I’ve had a word for the year. This last year it was Arise! Complete with the exclamation point, mind you. I have to tell you, I did not figure it meant literally, but it seems it did. With all the changes going on in my life over the last couple years, my quiet time has bounced around a fair bit. Getting the time and the quiet was…tough. Some days it was impossible…because of how I ordered my days. When God gave me Arise! 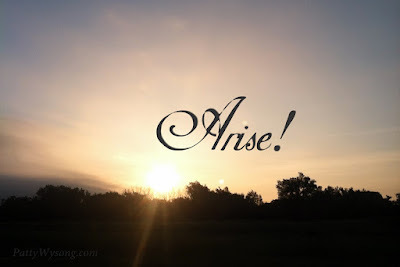 for 2015 I thought it referred to arising to the challenge or arising to a new season in my life, NOT arising early in the morning. I’m fond of my bed in the morning. It’s so warm and comfy and snuggly with my hubs. Being the first one out of bed in the morning is not my idea of fun. Then my awesome Sunday School teacher challenged us to ask God for help doing something we knew we should do but hadn’t been able to. Something like not eating too many Little Debbie cakes in one day or spending time in God’s Word. So, I did. Ask God to wake me up in the morning. Commit to obeying and getting up when He wakes me. Obey and GET UP when God wakens me. Thank God for waking me. Remember I said almost painlessly? I learned to be thankful for not just the days God woke me, but also for the headaches. Often, thanks to them, I had extra time with God and those times were special. It does, after all, mean get up. Rise to the challenge by asking God for help. When Cheryl and I started the NaBloPoMo on November 5, our goal was daily posting for 30 days. Unfortunately, neither one of us made it but it wasn't a wasted effort. 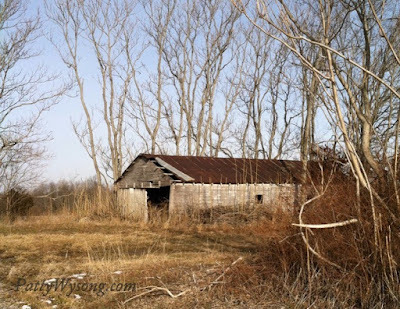 In the past, both of us have been avid bloggers but recently, with how our lives have changed, our blogs had fallen silent. My goals were to get past the hurdle of a silent blog and to see how blogging would look for me at this stage in my life, and if I’m totally honest, to see if I could juggle it with everything else and if I even wanted to blog. Those goals were all met, even though I only posted 17 times in 30 days. I struggle with balance and I was determined to keep blogging in balance with the rest of my life and responsibilities. And I did. Thanksgiving week hit and my life slipped into high gear. I needed to focus on family and then work, and I did. Jumping back into blogging like I did forced me over the hurdle I had been camped at for too long. I found that I could add blogging back into my schedule, but it took determination and discipline. Lots of both, mixed with a generous portion of time—something I need to work on. A major goal for those 30 days was to see what I posted when scrambling for posts (like I knew I would, LoL). I wanted to see if my focus had shifted while I was away from here. It was cool to see what came out. Because I didn’t make it the 30 days, I didn’t even get through my list of post ideas, and I didn’t touch the topics that I know are favorite soap-boxes of mine. But it was still enough to give me the answers I sought. All told, blogging 17 days out of the hoped-for 30 days is a win for me. I remembered that I love blogging. I remembered the work it is yet how rewarding it can be. And I remembered how it kicks my creativity and thinking into gear and gets me rolling. It was a very worthwhile endeavor.